Jewellery Shows and Launch Events are the most popular events where people look at display cabinets for hire. The cabinets will arrive in great condition and will be set up ready to use. Batteries will be charged and lighting will be ready just to be switched on. Logos, if you have ordered them, will be applied in advance. Parking spaces and delivery slots are not on your mind as we take care of this for you. After the event, you can just take your things and leave. No waiting around to load your cabinets into a van. 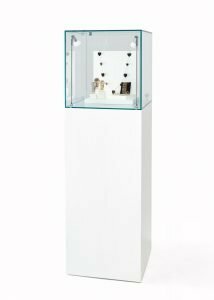 The 40cm Glass Cabinet is perfect for one collection of jewellery or one small item to put on display. 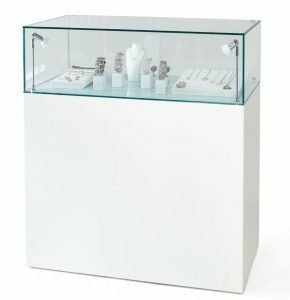 The 50cm Glass Cabinet is perfect for several items of jewellery or one small item to put on display. 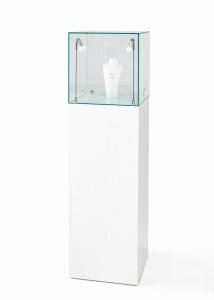 The 100cm Glass Cabinet is perfect for several items of jewellery or one small item to put on display. All cabinets are made from 8mm toughened glass and have lockable doors to the glass cabinets at the rear. Lighting is LED battery powered and the bulbs are for fitting MR16. 3000k spectrum bulbs are provided or 6000K bulbs can be requested. The batteries are USB Battery Packs and they have 55 hours of ‘on time’. For hire you will be provided with enough batteries for your event and if you require, a charger can be sent. They take approximately 6 hours to charge, however with a spare battery this is easy to manage. The digital display on the battery tells you what percentage of battery you have left before it will need charging. The plinths themselves are spray finished and approximately 70% of hire stock have doors in the plinths too for internal storage. We cannot guarantee that you will have the lockable storage on the plinths please make sure you request it if you want storage included. We deliver the cabinets in our company vehicle with our own designated drivers. Our driver David will come on his own and if he needs assistance we use the TORO crew in the event that several cabinets need setting up for an event. It helps us quote faster if you give us as much information as you can with regards to delivery addresses and postcodes, as well as venue specific details regarding delivery. If you have an event where you would like more than our stock levels for hire, we will need at least 6 weeks lead time prior to the event date in order to make extra stock. There are several shows of the year where our stock levels are all on rental, including The Spring Fair, The Wedding Shows and IJL. Please contact us as soon as you have a requirement for the display cabinets for hire. Pricing is sent in a quotation, which includes the availability, the distance for delivery and the amount of time the cabinets are needed for. Please call us, email us or fill out the enquiry form online so that we can put a quote together for you.